Sometimes I find something nice, beautiful or fun to make and buy matching yarn and sometimes I find yarn and seek a pattern that makes the yarn show off better. The latter was te case with this Boho Shawl. The yarn has different colors and there's a very fine golden thread braided through the yarn. To give the shawl a more boho look, I bought little golden pendants to attach to the ends of the shawl. I love the result. 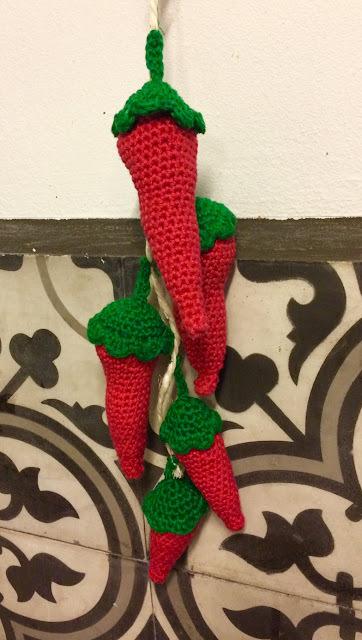 Last week a couple of girls came over to learn to crochet. Besides the yarn and the hooks, I also took care of the snacks and drinks. One of the things I made, was Saffron Peach Ice Tea. Being a real fan of ice tea, I love to experiment with taste and ingredients, so when I saw this recipe on Pinterest, I had to try. It's delicious! A keeper! 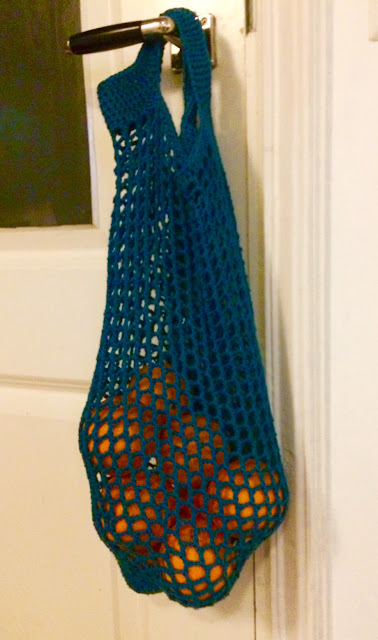 My Market Bag was featured by The Charm of Home and by The Stitchin' Mommy! Thank you, Sherry and Amy! For last week's Made It! 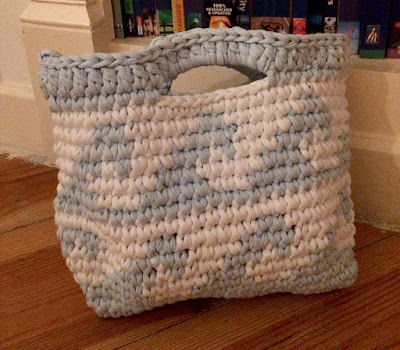 I crocheted a bag with a wave pattern, the big waves you can surf. 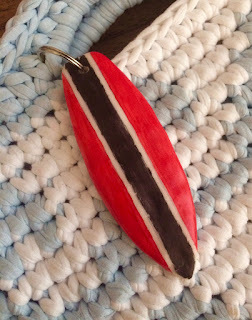 To give it a surf theme even more, I made a Surf Board Key Chain this week. The Pipeline Bag itself was featured by Sew Can Do, Plucky's Second Thought and by Scrapality this week! Thanks, Cheryl, Jessica and Andrea!! On Alisa Burke's blog, that I follow for quite some years now, I saw this great side dish idea: a fruit pizza. 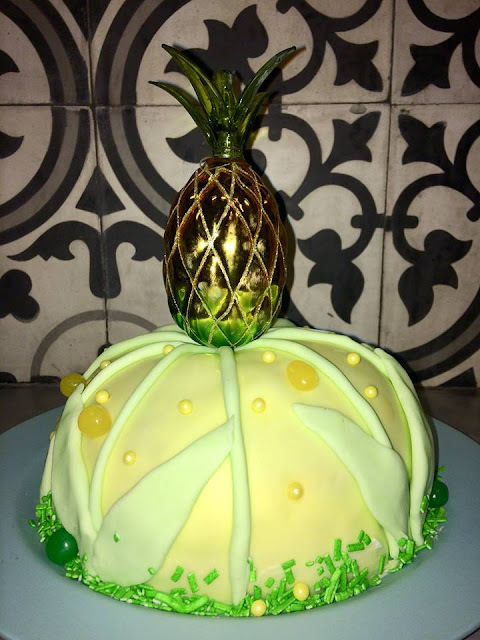 That's what I'm going to make for next week. 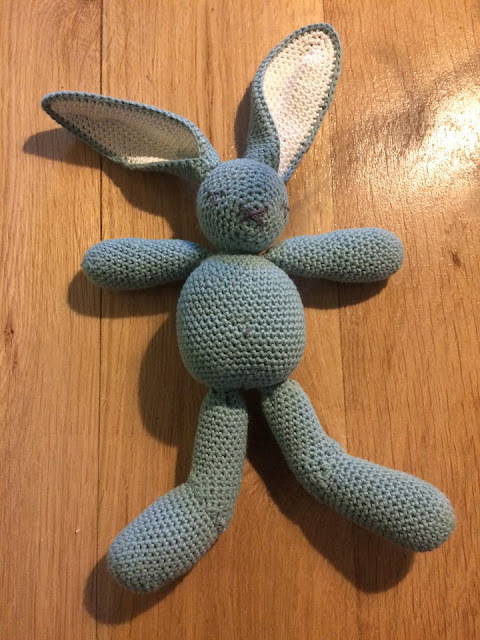 One of the blogs I follow is The Purl Bee, where you can find anything on sewing, crocheting, knitting and other things involving yarn and/or thread. Most of the time the posts are very inspiring and come with nice patterns. 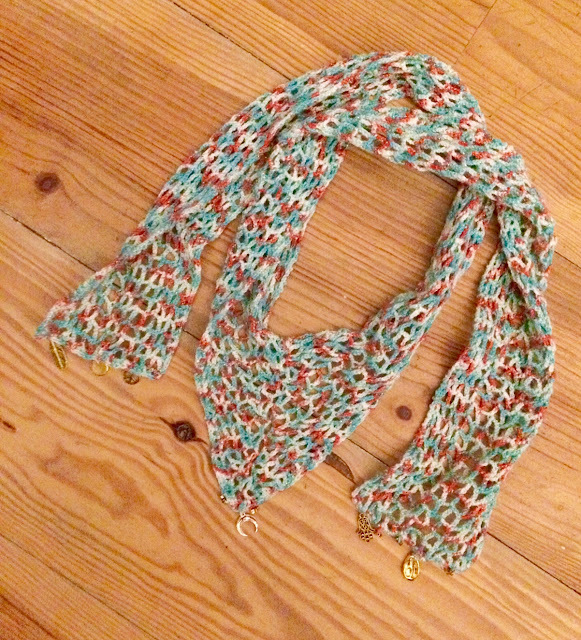 And every now and then I make something I found at The Purl Bee. After a spring clean up of my cabinets I found this Hawaiian fabric, that I bought a while ago. So long ago actually, that I had totally forgotten all about it. Don't even remember where I bought it. 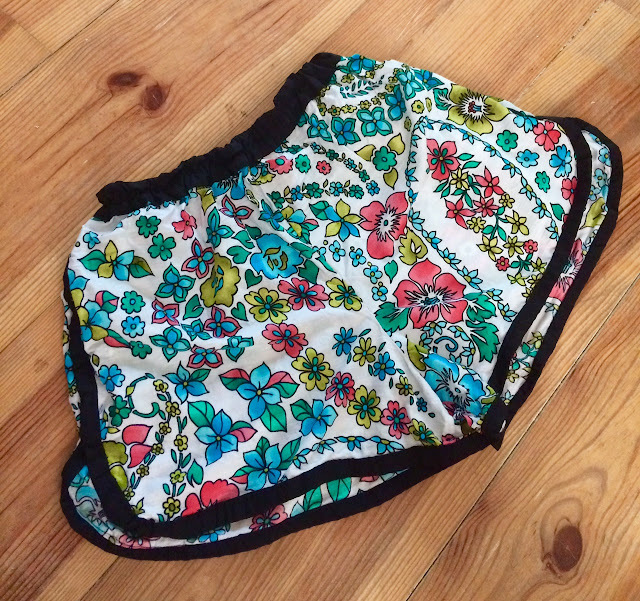 I haven't seen my sewing machine for quite some time either, but the combination of the fabric found and the inspiration I found on The Purl Bee, made me want to make this short. I made the biggest size, because I like wide leg pants on shorts. The taille is elastic. 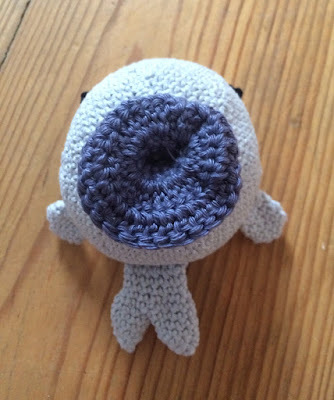 You can check out the (very easy) pattern at The Purl Bee. There's one for girls and one for women. Since we went to Sicily, Italy a couple of weeks ago I love almost everything that's made with lemon. 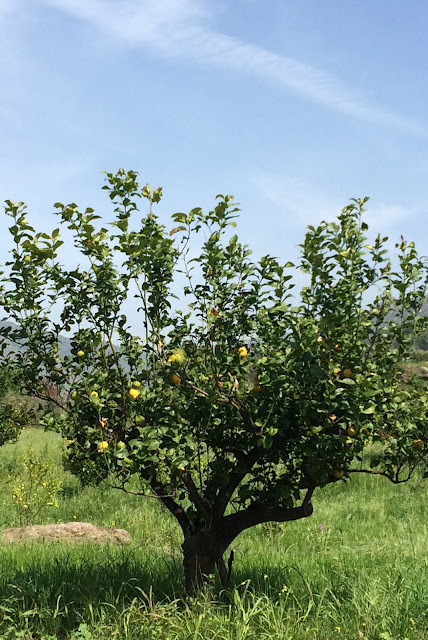 Lemons are used a lot in dishes in Sicily and you see lemon trees growing everywhere, as if it is weed. Before I wasn't very fond of lemons, but now I can't get enough of its freshness. Makes me feel like summer has already started immediately. So today I made these Lemon Cookies with Poppy Seed. The recipe is to be found here. And here's the bag I promised to make this week for Made It!. 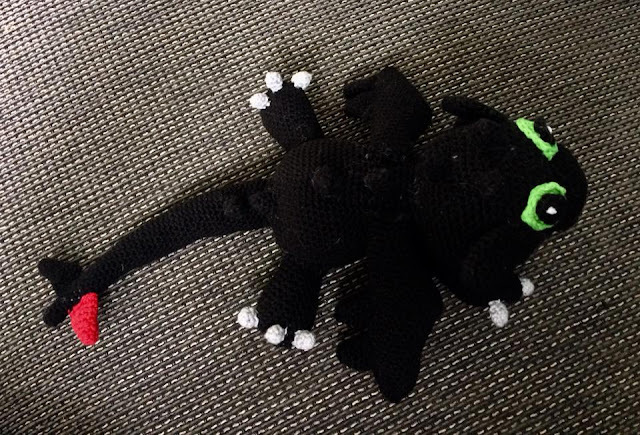 I was delayed a little bit, because I always try to post three crafts in a week, on Friday, Saturday and Tuesday, but I found it becomes harder and harder to keep up with my own crafting pace, due to other obligations. I think I have to choose projects that take a little less time for Made It!. Anyway, this week I'm just in time for midnight (CET) to post the result. Seven colleagues expecting babies. Seven! Busy (crochet) times ahead. The first baby present is finished. For a baby boy I made this little whale. I just saw a lot of my projects were featured on the Pinterest board of Strawberry Butterscotch. Thank you very much, Anna!!! Last week I showed you the Blue Hawaii Mandala (free pattern) I wanted to make. I used other colors and named mine Lua Pele Melia Mandala (lua pele meaning volcano and melia meaning plumeria). Before I went to Sicily I saw this great bag, but I just hadn't enough time to make this one to take with me on vacation. Our next trip is planned in two months, so I would say: plenty of time now. 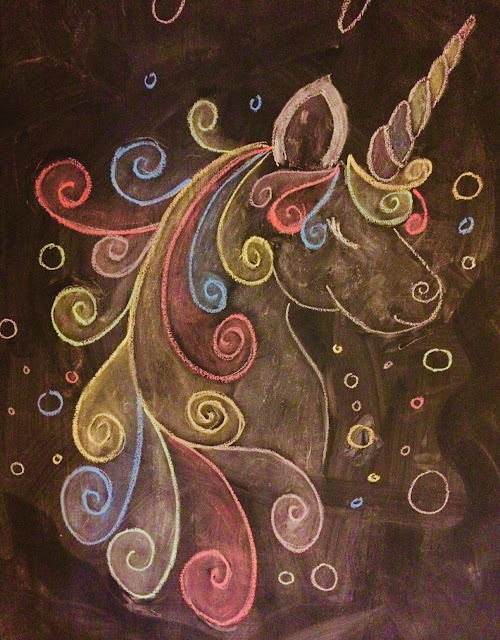 My youngest daughter has a new crush, namely The Unicorn. We already had Rabbits, Flamingos and Angler Fishes and now we have Unicorns. And because I had some rainbow colored yarn left from a never finished project, I could finally use it: for the manes and the tail. 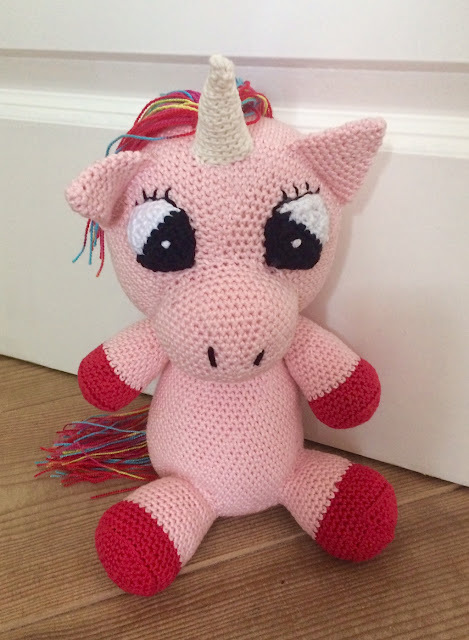 I made up the pattern myself and didn't write it down on the go, but my daughter wants another unicorn, a male (and the male unicorns are blue, as you certainly knew), so hopefully I don't forget to make notes next time. Food is good in Italy, nobody can deny that. In Sicily it isn't any different, of course. A lot of the souvenirs in tourist shops have to do with food. Cook books, magnets of lemons, cooking aprons, attributes to cook with, name it and you'll find it. Last week I skipped a week of Made It, due to vacation and a broken laptop, but this week I make it up. The Hand of Fatima (idea found here) is finished. I made it of white polymer clay, carved flowers and figures in it, rubbed it in with different colors of water color paint and dabbed it dry afterwards, so paint would only stay in the carvings. What I want to make next week, is something bohemain-like again. 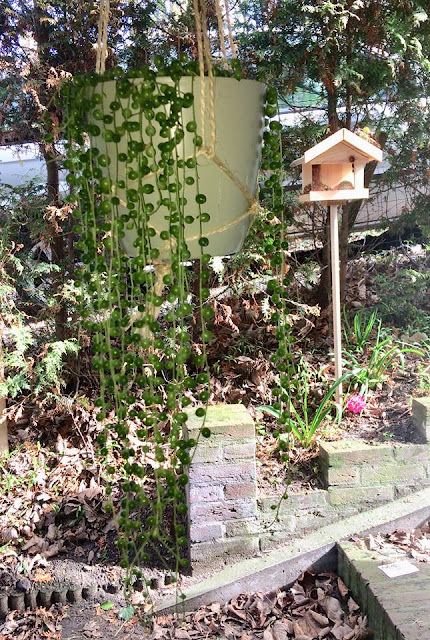 In summertime I always love to decorate my garden with bohemian stuff. 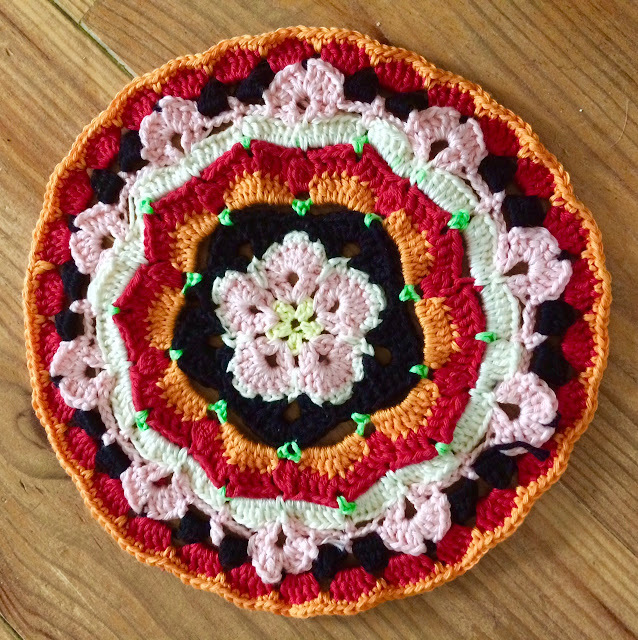 I found this free pattern for the mandala here. Just home from our trip to Sicily and as said in the post before, the food was excellent! Even in restaurants that locals would consider crappy, for us it was much better than a lot of Italian restaurants we find in our own country. Ingredients were always fresh, for example. People sold food beside the roads, from their own land I guess, so maybe fruits and vegetables weren't even genetically manipulated, too. 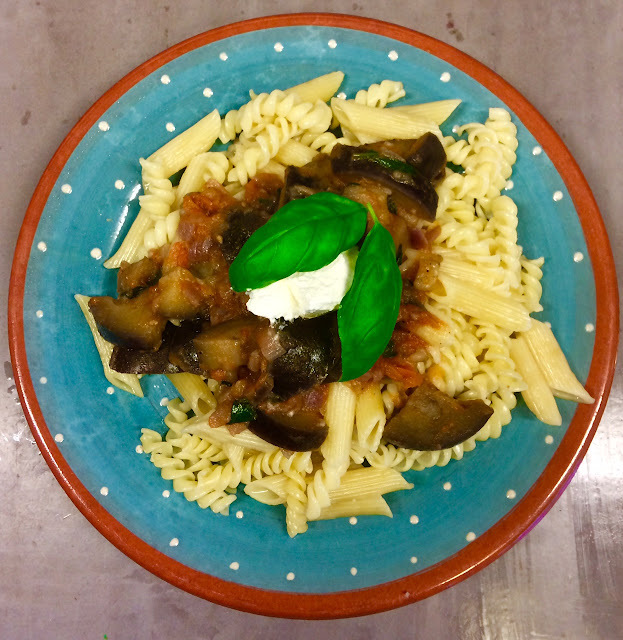 One of the things we ate a couple of times was Penne alla Norma. As a vegetarian I loved to find a dish like this. There's no meat in it, but it's not vegetarian per se, and that are the recipes I like the most.